272 pages | 75 B/W Illus. The Monte Carlo method has become the de facto standard in radiation transport. Although powerful, if not understood and used appropriately, the method can give misleading results. Featuring illustrative examples, mathematical derivations, computer algorithms, and homework problems, Monte Carlo Methods for Particle Transport provides nuclear engineers and scientists with a practical guide to the application of the Monte Carlo method. "Dr. Haghighat’s Monte Carlo textbook is, in my opinion, the best textbook on Monte Carlo neutronics available. It does a great job covering the basics of Monte Carlo and of particle transport. I recommend it to my students in my Monte Carlo class and to everyone doing research in this field." "This is an outstanding reference and textbook on applied stochastic methods. 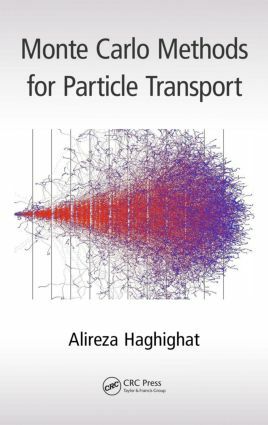 It is a must-have for scientists, students, and practitioners interested in Monte Carlo methods for solving particle transport problems. This book provides an excellent description of the fundamentals through numerous example problems and a rich discussion of advantages and pitfalls of the Monte Carlo method. The chapter on solving eigenvalue problems is long overdue, where diagnosing convergence of the fission source in reactor physics problems with high dominance ratio is challenging and as a result has been a subject of much research." "This is a very solid book for graduate students in nuclear engineering to learn how the Monte Carlo method can be used to solve reactor physics problems. It covers the fundamentals of Monte Carlo simulations before discussing how the technique can be used to solve fixed and fission sources neutron transport problems. Excellent examples are provided in the main text, in addition to a complete set of homework problems at the end of each chapter. This makes it an ideal textbook for those teaching a course on simulation methods in reactor physics." "Professor Haghighat, based on his many years of experience in teaching the subject, has written a long-awaited book on Monte Carlo methods. The subject of the book based on particle transport has an old history in concept, but is becoming lately more important and enjoying heavy use with the advent of high-performance computers. Professor Haghighat has succeeded in writing a book that is concise, but also includes all ingredients in the Monte Carlo method. … [This book is] an excellent addition to the bookshelf of teachers, students, researchers, and practitioners in the field of nuclear reactor design and radiation shielding applications." Useful Theorems Associated with the "True Variance"
Alireza Haghighat is a professor at Virginia Tech. He has served as the director of the Nuclear Science and Engineering Lab in Arlington, Virginia, and led the Virginia Tech Theory Transport Group. He previously worked at Penn State and the University of Florida. He holds a Ph.D from the University of Washington. He has published numerous papers, received several best paper awards, and presented many invited workshops, seminars, and papers nationally and internationally. He is a recipient of the 2011 Radiation Protection Shielding Division’s Professional Excellence Award, and a recognition award from the Office of Global Threat Reduction. An ANS fellow, he has served in various ANS leadership positions.